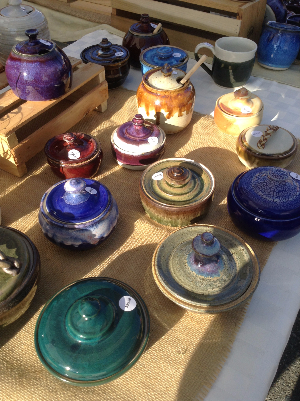 Debbie Bierle of Debbie BB Art joined Duvall Farmers Market during the last few weeks of the 2014 market season, with fine hand crafted pottery. We are pleased to have Debbie back again, sharing booth space with long time friend AnnMarie Stickney of Cherry Valley Dairy. Debbie has been hard at work over the winter creating beautiful round butter dishes with lids which fit the round butter tubs from Cherry Valley Dairy. Debbie's introduction to pottery began three months after a battle with cancer in 2010 when a wonderful and caring friend asked her if she would like to take a pottery class with her. This was an ideal invitation and opportunity as Debbie loves to create things with her hands. It was a challenge working with the pottery wheel, and in retrospect, Debbie sees how great a challenge it was because the effects of chemotherapy on her brain made the learning curve steeper. But it was a good and healthy challenge and Debbie really enjoyed the class. A year and a half later, Debbie reconnected with a cancer survivor friend who had also taken a pottery class in the same studio as Debbie. Her friend suggested they take another class together. They drove right down and signed up for the class together. Debbie has been taking classes and making use of the pottery wheel and kiln ever since. She works out of Bruning Pottery in Snohomish, purchasing her clay through them. She mostly uses a porcelain clay known as Kenzan clay. On occasion Debbie uses a recycled clay, a combination of all the types of clays used at the studio, and is more of a stoneware type clay. In addition to the butter dishes for Cherry Valley butter, Debbie also produced a new line of honey pots this winter. Debbie BB Art offers mugs, drinking cups, small prep bowls, spoon rests, small vases, miniature tea cups, small saucers for sushi dipping sauces or oil and vinegar, quip holders, and a variety of plates, including plates made with leaf imprints. To identify which type of clay has been used, turn over the pottery piece and look on the bottom side. Porcelain has a white bottom and the recycled clay has a brown bottom. 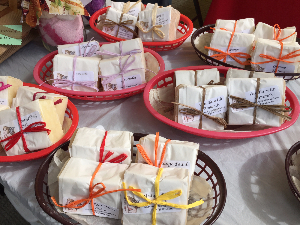 All of Debbie's pottery items are microwave, oven and dishwasher safe as well as waterproof. Wine packaged in eco-friendly totes. Wine tasting will be offered this year!